Trail – a mark or a series of signs or objects left behind by the passage of someone or something. 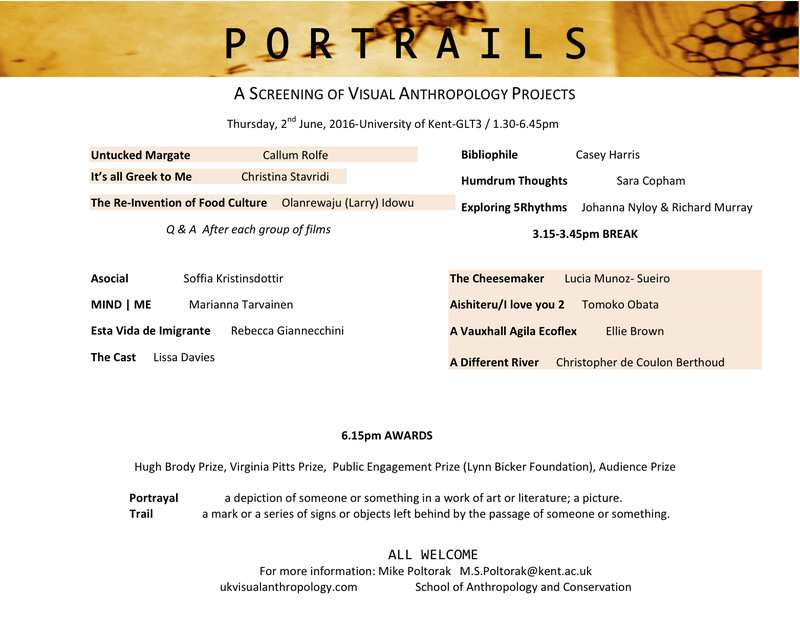 This year’s screening of fourteen final year visual anthropology projects took us on an afternoon long journey with the portrayal of groups or particular people as a common theme. We were very happy to welcome Dr Virginia Pitts from the School of Arts as a new judge to award a prize in her name. She has a remarkable wealth of experience in practice-based research projects developed in part out of her career in British and New Zealand film and television industries. You can learn more about her research, creative work and very popular teaching here. Having held many roles in documentary and television drama production we were very curious what she would make of video productions made by students doing all the preparation, camera-work and editing themselves. We also welcomed back Professor Hugh Brody, who has been a stalwart supporter of our screenings for many years. He is Canada Research Chair in Aboriginal Studies at the University of the Fraser Valley as well as being an Honorary Professor here at the University of Kent. His films and publications have have been hugely influential in engaging with contemporary indigenous peoples’ challenges. His most recent project, ‘Tracks across Sand’, is an interactive DVD project focussed on the first Bushman land claim in South Africa containing some remarkable archival footage and resources now shared across the whole continent. More recently he has been working on a video project in ‘the Jungle’ in Calais. Student productions were shown in groups with the opportunity of a joint Q&A at the end of each screening. To hear a review of all the films by Professor Hugh Brody, the prizes being awarded and see the prizewinning films scroll down. Christina Stavridi & Calum Rolfe during the Q&A for their films. Casey Harris & Richard Murray in Q&A. Screenshot of Casey Harris’ ‘Bibliophile’. Justin Gilday (The Cast) shares the powerful experience of working with Lissa Davies. Lucia Munoz- Sueiro, Tomoko Obata and Christopher de Coulon Berthoud during the Q&A. Christopher de Coulon Berthoud responding to a question about his film. Professor Hugh Brody sharing his impressions of the films. Soffia Kristinsdottir receives the Runner-Up prize for the Hugh Brody Visual Anthropology Prize. Richard Murray receives the Hugh Brody Visual Anthropology Prize on behalf of Johanna Nyloy and himself. Professor Michael Fischer awards the Public Engagement Prize on behalf of the Lynn Bicker Foundation for Rebecca Giannecchini. Soffia Kristinsdottir receives the Virginia Pitts Runner Up Prize. Dr Virginia Pitts speaks about the two prize winning films. Lissa Davies receives the Virginia Pitts Prize. Soffia Kristinsdottir receives the joint audience prize from Dr Daniela Peluso. Tomoko Obata receives the joint audience prize from Dr Daniela Peluso. Marianna Tarvainen receives the Virginia Pitts runner up prize. Virginia Pitts asks a question during the Q&A. Last year Hugh Brody Visual Anthropology Prize winner, Joe Spence, to her left.